Common sharp-tailed snake (photo by Bill Leonard). The common sharp-tailed snake is a small regional endemic colubrid snake that is rarely encountered and little studied. In Washington, sharp-tailed snakes rarely exceed 300 mm (11.8 in.) total length (Nussbaum et al. 1983). The dorsal coloration is reddish brown to grayish brown. The red coloration is most intense near the tail, and a narrow band of copper-red may be present along the sides (St. John 2002). The tail is short, tapers to a point and terminates with a short spine-like scale. A dark eye mask is typically present (St. John 2002). The ventral pattern is distinct with alternating black and dull white banding (Nussbaum et al. 1983). A long-tailed form found in coniferous forest of Oregon and California was recently described as a distinct species (Feldman and Hoyer 2010). The common sharp-tailed snake occurs from British Columbia into southern California (Leonard and Ovaska 1998). The species has a spotty distribution in Washington with almost all records from the east slope of the Cascades (Figure 2; Nussbaum et al. 1983). Habitat. In Washington, the snakes are known from forest openings dominated by Garry oak (Quercus garryana), particularly with rock accumulations, and from riparian deciduous woodland with accumulations of decaying down woody logs within ponderosa pine, oak, or shrub-steppe (Hallock 2009). Common sharp-tailed snakes seem to have a diet mainly restricted to small slugs (Zweifel 1954, Cook 1960, Engelstoft and Ovaska 2000a, Britt et al. 2009, Weaver and Kardong 2010), and their long, re-curved teeth may be a specialization for grasping and holding them (Zweifel 1954, Britt et al. 2009). They may also prey on terrestrial snails (Weaver and Kardong 2010). The life history of sharp-tailed snakes is poorly known due to the difficulties associated with studying small species that lead largely subterranean lives (Cook 1960, Leonard and Ovaska 1998). Consequently, little is known about time of mating, oviposition sites, age at sexual maturity, frequency of reproduction, activity patterns, or home ranges (Engelstoft and Ovaska 2000a). Aggregations are often observed, but it is not clear if the snake is gregarious or simply concentrates in small favorable areas (Cook 1960, Leonard et al. 1996, Hoyer et al 2006). Leonard et al. (1996) suggested that aggregations of sharp-tailed snakes observed in April-May on the east slope of the Cascades are related to breeding activities. Most surface activity takes place in the spring and fall (Cook 1960, Nussbaum et al. 1983) with smaller numbers found in July and August typically during or after rain events (Engelstoft and Ovaska 2000a, 2000b). Observations of this species in the open are uncommon (Cook 1960), but based on individual snakes found on roads, they will at least occasionally cross exposed areas with no plant cover (Hallock 2009). Sharp-tailed snakes are relatively sedentary. A study in British Columbia found 6 of 18 recaptured snakes were always found under the same cover object and movements of tracked individuals under artificial cover objects were relatively short; the average distance between the two farthest captures was about 25 m (Engelstoft and Ovaska 2000a). Understanding of overwintering behavior is extremely limited and it is not known if the species actually hibernates. The lack of observations during the coldest periods suggests the animals are underground. The period of inactivity, if it occurs, is short (1-3 months) based on seasonal activity patterns (Hallock 2009). Population trends. Little is known about the population trends of this species. These snakes are apparently abundant and not of conservation concern in Oregon and California (Hoyer et al. 2006, Hallock 2009), but the species is rarer and less well-distributed in Washington and British Columbia. It is considered vulnerable in Washington because it is known to occur in only 14 widely disjunct areas (McAllister 1995, Dvornich et al. 1997, Leonard and Leonard 1998, O’Donnell and McCutchen 2008, R. Weaver unpubl. data; and WDFW WSDM database). West of the Cascade Mountains there is a historical site at Gravelly Lake, Pierce County, where it was last observed in the 1970s, and a recently discovered site on Orcas Island in San Juan County (O’Donnell and McCutchen 2008). East of the Cascade crest, they have been found in two areas in Chelan County, five areas in the Yakima River watershed in Yakima and Kittitas counties, four areas in Klickitat County, and in the Wind River drainage in Skamania County. Potential threats to species. Although the species appears to tolerate some degree of disturbance, intensified urban development associated with an expanding human population threatens its survival as perhaps demonstrated by the apparent extirpation of the species in the Puget Sound area. Activities that alter moisture regimes, remove rock or woody debris, alter rocky areas by destroying or filling interstitial spaces between rocks, or fragment habitat have the potential to harm sharp-tailed snakes by degrading their habitat and microhabitat features. These activities may also degrade habitat for slugs, their main prey species. Additional activities that may threaten small localized populations include timber harvest, fire, road-building, and development (Hallock 2009). Roads probably cause significant mortality at several sites; sharp-tailed snakes have been found four times on roads in Yakima County where the road runs adjacent to the river in a narrow riparian zone (WDFW WSDM database). The recovery strategy in British Columbia provides a description of potential threats associated with expanding urbanization including habitat loss, fragmentation, and habitat degradation, and mortalities from vehicles and lawn-mowers, and pesticides (Sharp-tailed Snake Recovery Team 2008). The apparently low population densities and restricted distribution are also factors (Engelstoft and Ovaska 2004, Ovaska and Engelstoft 2008). Information needs. Owing to the lack of information on distribution and abundance, the main management consideration is to locate possible undiscovered populations especially those that may occur outside the areas where the species is known to exist. If it turns out the species is more common, as was found in Oregon (Hoyer et al. 2006), then additional conservation actions may not be needed beyond basic habitat maintenance where the species occurs. In 2012, a new location for the sharptail snake in Klickitat County was reported. The new location was 15 miles from known observations for this species. Partners and Cooperators: Washington Department of Natural Resources’ Natural Heritage Program, U.S. Forest Service. Britt, E.J., A.J. Clark, and A.F. Bennett. 2009. Dental morphologies in garter snakes (Thamnophis) and their connection to dietary preferences. Journal of Herpetology 43(2):252-259. Cook, S.F. 1960. On the occurrence and life history of Contia tenuis. Herpetologica 16: 163-73. Dvornich, K. M., K. R. McAllister and K. B. Aubry. 1997. Amphibians and reptiles of Washington State: location data and predicted distributions, Volume 2 in Washington State Gap Analysis - Final Report, (K. M. Cassidy, C. E. Grue, M. R. Smith and K. M. Dvornich, eds. ), Washington Cooperative Fish and Wildlife Research Unit, University of Washington, Seattle, 146 pp. Engelstoft, C. and K. Ovaska. 2000a. Natural history of the sharp-tailed snake, Contia tenuis, on the Gulf Islands, British Columbia. Proceedings of a conference on the biology and management of species and habitats at risk, Kamloops, B.C., 15-19 Feb., 1999. Volume One. B.C. Ministry of Environment, Lands and Parks, Victoria, B.C. and University College of the Cariboo, Kamloops, B.C. 490 pp. Engelstoft, C. and K. Ovaska. 2000b. Artificial cover-objects as a method for sampling snakes (Contia tenuis and Thamnophis spp.) in British Columbia. Northwestern Naturalist 81(1): 35-43. Feldman, C. R., and R. F. Hoyer. 2010. 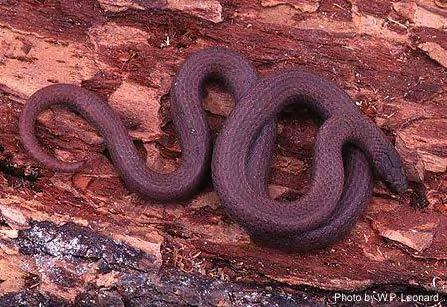 A new species of snake in the genus Contia (Squamata: Colubridae) from California and Oregon. Copeia 2010: 254-267. Hallock, L. 2009. Conservation assessment for the sharp-tailed snake in Washington and Oregon.Washington Natural Heritage Program, Department of Natural Resources, Olympia. Prepared for USDA Forest Service, Region 6 and Bureau of Land Management, Portland, Oregon. Hoyer, R.F., R.P. O’Donnell and R.T. Mason. 2006. 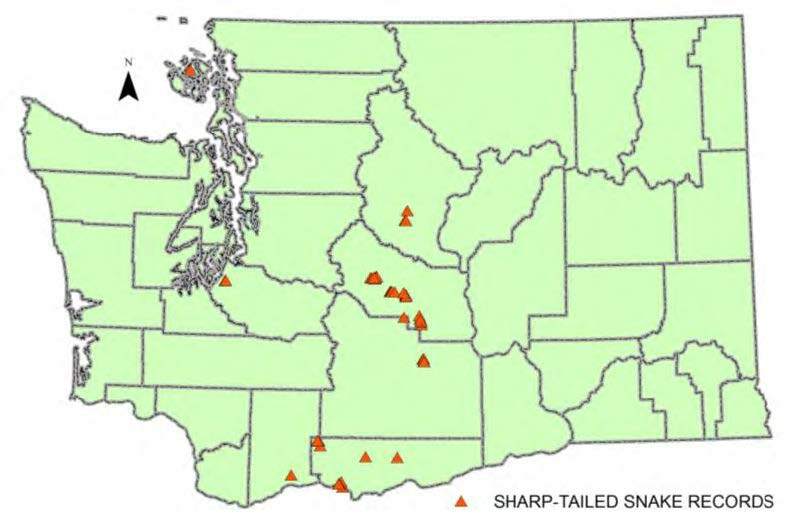 Current distribution and status of sharp-tailed snakes (Contia tenuis) in Oregon. Northwestern Naturalist 87: 195-202. Leonard, W.P. and K. Ovaska. 1998. Contia, C. tenuis. Catalogue of American Amphibians and Reptiles. Society for the Study of Amphibians and Reptiles. Leonard, W.P., D.M. Darda and K.R. McAllister. 1996. Aggregations of Sharptail Snakes (Contia tenuis) on the east slope of the Cascade Range in Washington State. Northwestern Naturalist 77: 47-49. Leonard, W.P. and M. A. Leonard. 1998. Occurrence of the Sharptail Snake (Contia tenuis) at Trout Lake, Klickitat County, Washington. Northwestern Naturalist 79:75-76. McAllister, K. R. 1995. Distribution of amphibians and reptiles in Washington State. Northwest Fauna Number 3: 81-112. Society of Northwestern Vertebrate Biology. Nussbaum, R. A., E. D. Brodie, Jr., and R.M. Storm. 1983. Amphibians and reptiles of the Pacific Northwest. University of Idaho Press, Moscow, Idaho. 332 pp. O’Donnell, R.P. and D. McCutchen. 2008. A sharp-tailed snake (Contia tenuis) in the San Juan Islands: Western Washington’s first record in 58 years. Northwestern Naturalist 89:107-109. Ovaska, K.E. and C. Engelstoft. 2008. Conservation of the sharp-tailed snake (Contia tenuis) in urban areas in the Gulf Islands, British Columbia, Canada. In Mitchell, J., R. Jung, Brown and B. Bartholomew (eds.). 2008. Urban Herpetology. Herpetological Conservation 3:557-564. Society for the Study of Amphibians and Reptiles. Salt Lake City. Sharp-tailed Snake Recovery Team. 2008. Recovery strategy for the sharp-tailed snake (Contia tenuis) in British Columbia. Prepared for the B.C. Ministry of Environment, Victorica, BC. 27 pp. Slater, J.R. 1939. Contia tenuis rediscovered in Washington. Occasional papers, Department of Biology, College of Puget Sound 3(1-5): 5. St. John, A. 2002. Reptiles of the Northwest. Lone Pine Publishing 272 pp. Storm, R.M. and W. P. Leonard, W.P. (Coordinating Editors). 1995. Reptiles of Washington and Oregon. Seattle Audubon Society The Trailside Series, Seattle, Washington. 176 pp. Weaver, R.E, and K.V. Kardong. 2010. Behavioral responses to potential prey through chemoreception by the sharp-tailed snake (Contia tenuis). Northwestern Naturalist 91:58-62. Zweifel, R.G. 1954. Adaptation to feeding in the snake Contia tenuis. Copeia 1954(4): 2999-300.